At this Morocco countryside retreat we know our guests will easily relax. With yoga and meditation there is only mind, body and soul to breathe into. 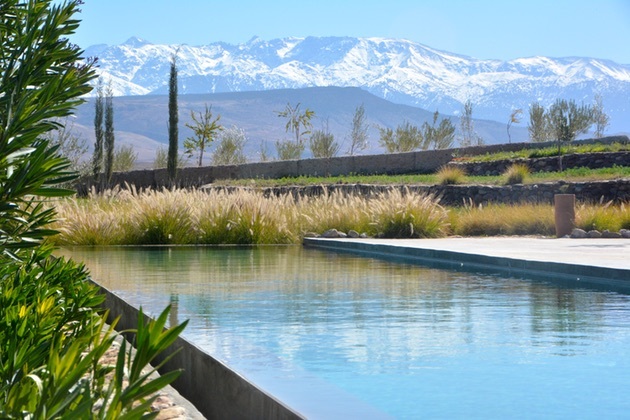 We have found a fabulous new gem in Morocco, just 50 minutes from Marrakech. 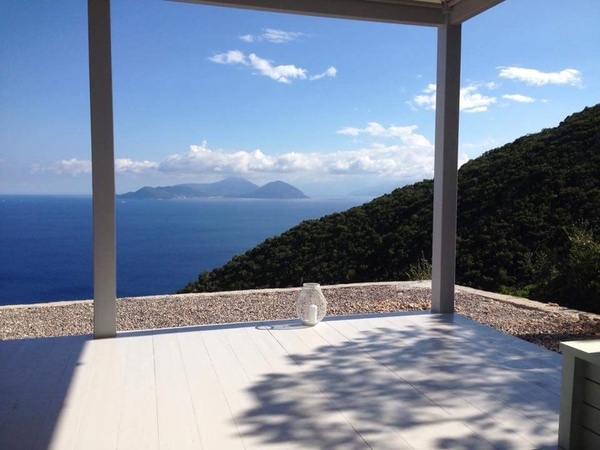 It’s perfect for relaxing and forgetting the strains of everyday life. She is set near a Berber village, a jewel on the placid lake Lalla Takerkoust, the snowy Atlas mountains her backdrop. Our new Morocco countryside retreat is a kasbah (castle or fortress), a monarch next to the village. Resting on 15 hectares of traditional gardens, the earth there is rich, producing fruits and vegetables for nourishing meals. The Kasbah honours ancient farming styles, with extensive irrigation systems gurgling amongst the mud walled villas and rooms. The waters wind through lavender and herb gardens, routed by small metal sluices. It is music to ears and soul. We realized this would be the perfect place for our guests to relax. Greeted by the warmth of Mohammed on arrival, we meandered along stone pathways through gardens of swaying grasses. We arrived at our “lodge”. Floor to ceiling glass was fronted by the rich browns of earth, deep blue of the skies, and sparkling white mountains. We found our decent sized room with an en-suite tadelakt bathroom. High-thread Egyptian cotton bedlinen and fluffy white towels won us over. At the kasbah we really felt the warmth of Berber hospitality gazing on the waning light over mountains strong and majestic. We wondered about the large white domed building with stained glass windows. This was an exquisite hammam and spa for you to be pampered in. Arriving there we were treated to a mint tea at the fireplace. Relaxed and warm bodies were wrapped in fluffy white bathrobes after a scrub and massage. An outside terrace also awaits you to soak in the sun. 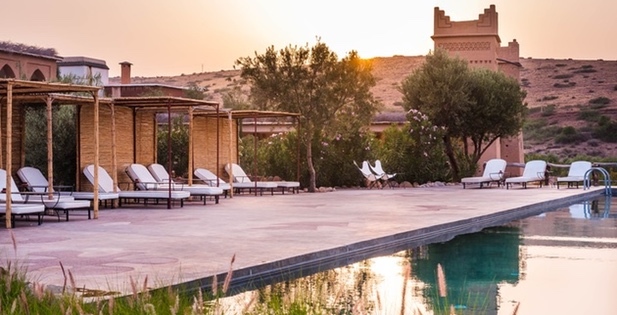 This Morocco countryside retreat was going to be the ideal refuge for our guests between sessions of yoga and meditation. Heading towards the lake we stumbled upon not one, but two swimming pools, ideal for doing lazy lengths. You have the choice of heated or not. Inviting sun loungers and beds were lined up with white towels and Moroccan grass hats. 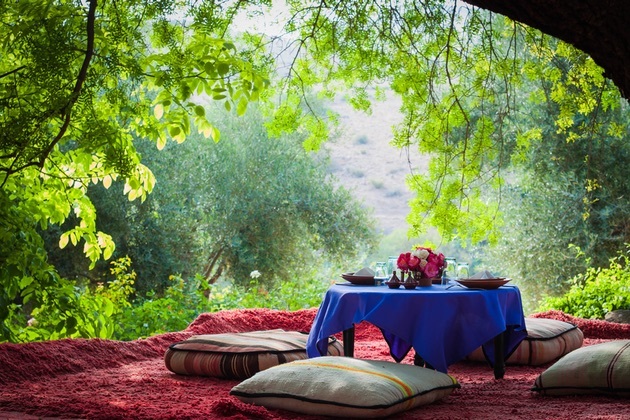 Surrounded by olive trees and gardens, lunch was being served on colourful cushions and Moroccan rugs. No rush, no stress, pure heaven. By night we sank into leather arm chairs at the fireplace of the main kasbah. Mohammed seemed to read our minds, taking care of every wish. His service was just amazing. We savoured delicious Moroccan cuisine at its best. The crowning jewel of the Morocco countryside retreat is the yoga and meditation room, perched at the top of the property. It is graced with floor to ceiling windows, and a Berber tent ceiling and roof. Having discovered the spirit of the place, we know our guests will easily relax, with only minds, bodies and souls to breathe into. To find out more and join us for our first retreat on 23 September.